Taking care of your teeth should extend beyond the boundaries of your home. Dental examination is also critical to know your oral health status and keep dental issues from happening. Keeping tab of your oral health has a long list of benefits. At Bondi Dental, we believe in the importance of prevention in taking care of your teeth. Bondi Dental is your trusted local dentist in Bondi Beach. Experience advanced dentistry and friendly care you can trust at Bondi Dental! Dental examination includes regular visits to your dentist to check on the status of your teeth. Your dentist will prod and probe your pearly whites to make sure that they are healthy. During the examination, your dentist will also check for possible dental issues that might develop. From there preventive programs and treatments might be recommended for you. Scale and clean is one preventive treatment employed during your regular visits. 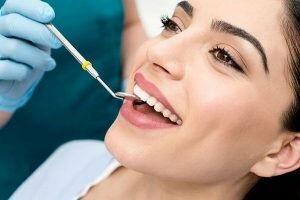 Your dentist removes the tartar build up on your teeth, using an ultrasonic tool, above and below the gumline, cleaning all the way down to gum pockets. Regular scale and clean prevents the development of dental issues such as tooth decay and gum disease. The earlier, the better. Keeping tabs on your oral health can help you stop their ruin before it even starts. Your dentist can also give you tips on how to take care of your teeth, including the right diet. You’re probably wondering how a regular visit to the dentist saves you money. Well, the answer is simple. Regular examinations are cheaper than getting a dental treatment for an already damaged tooth. So why have to spend money for something that could have been avoided in the first place? One integral part of dental examinations is an oral cancer screening. Oral cancer is a disease that destroys oral tissues (teeth, bone, gums, muscles and ligaments). Your dentist can detect this by the visual signs of tissue/cell changes and also sometimes through dental x-rays. It is a survivable disease if caught and treated early. With your teeth free from accumulated tartar, you’ll have fresher breath. During scale and clean, stains on your teeth are removed, revealing your teeth’s natural glow. Experience advanced dentistry and friendly care you can trust. Our team has combined dental experience of over 60 years, delivering premium quality dentistry to local Bondi community; the Eastern Suburbs; Sydney and its surrounding areas. Keep your smile healthy and bright at Bondi Dental. Call us on (02) 9365 7187 or request your appointment online today!